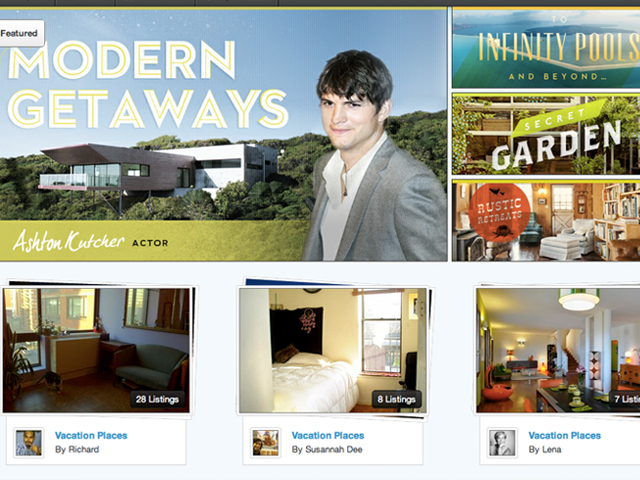 (CBS News) Airbnb launched a redesign of its website that is visually stunning and more social. Airbnb is an online service that matches people with vacation rentals. The service has been known to feature off-beat rentals, like converted airplanes, tree houses, boats and even castles. The new website now sports huge photos on its homepage and a new Wish List feature that lets users create a board of vacation rentals. Creating a visually pleasing experience is not new to the Airbnb experience. The company sends out photographers to homes in some markets to take professional photos of listed residences. "Airbnb photographers have now taken over 1,000,000 images of these unique listings, creating one of the largest collections of interior design photos in the world," Brian Chesky, chief executive officer and co-founder, said in a press release. It helps to have famous friend and investors, as well. Some of the wish lists created include "Modern Getaways" by Airbnb investor Ashton Kutcher and "Across the Sea" by Twitter co-founder Jack Dorsey. Other notable wish lists include "Vintage Inspired" by ModCloth co-founder Susan Gregg Koger and "Designer Retreats" by designer Yves Behar. The company wanted to add a layer of discovery for users to engage, an Airbnb spokesperson told CBS News. And part of that is including Wish Lists from interesting people and taste-makers. The new Wish Lists feature was preceded by a favorites feature, where users could star listings and save them for later. Airbnb saw a 20 percent jump in engagement with Wish Lists. Airbnb was established in 2008 and boasts 100,000 listings in 19,000 cities worldwide. The San Francisco-based company garnered attention when actor Ashton Kutcher became a strategic advisor in 2011. In June, the company reported that 10 million nights had been booked since the company launched in 2008.